Cake Decorating Stencils, pastry supplies, decorating tools. Cook up something sweet with a set of bakery tools for even the most discerning baker or pastry chef. Our collection of baking utensils includes everything from cake stands to flour sifters and will have you prepared for any recipe that crosses your counter, from cupcakes to pies to delectable pastries for the entire family to enjoy. We offer a wide selection of kitchen tools and products for each stage of the baking process, allowing you to get your favorite treats from the mixing bowl to the serving platter with convenience and style. You can choose from serveware, pastry bags and brushes, display items, cake decorators, and so much more. Shop our selection for great house-warming gifts, wedding gifts, restaurant tools, and everything you need to complete your bakeware set or wholesale offering. Shop our other trusted brands Wilton, Demarle, Ateco, and Kopykake. Does your bakeware set need a boost? Then shop our selection of high-quality, chef-approved pastry supplies for even the most demanding kitchen or bakery. Whether you're looking to tackle a new recipe or you're a seasoned professional baker with a product line of delicious edibles, we have just what you need to complete your set of baking utensils. We offer wholesale kitchen products for cakes, cupcakes, pastries, and more to help you bake and decorate your own culinary masterpiece. Our products are professional-grade and designed to last you for the life of your recipes. 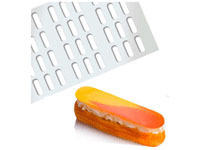 Our bakery tools include rolling pins , lattice wheels, pastry brushes, pasta machines scoops, and more. We also offer decorating tools and display sets for anything you can bake up. Our baking tools will get your creations from the oven to the display case with ease, allowing you to present your finished product with style. These products make great gifts for both professional and amateur bakers alike, as well as new homeowners and newlyweds, so pick something up for a friend or loved one today.